I am not big on souvenirs, in the traditional knick-knack sense. I don’t enjoy a collection of objects with no practical purpose other than to sit on a shelf and act as a reminder of somewhere I’ve been, or something I’ve done. That said, there IS something so nice about having a tangible reminder – a reason to think back to someone or somewhere that matters to me in some way. A long time ago now I began to collect jewellery as souvenirs. Whenever I wear something I bought in a particular place or with a particular person, I think back to that time and place. And that makes me happy. Rather than something that sits on a shelf and becomes so a part of the furniture I hardly notice it, each piece of jewellery gets my attention when I pick it up and put it on – and I start my day thinking happy thoughts of the person or place connected to it. 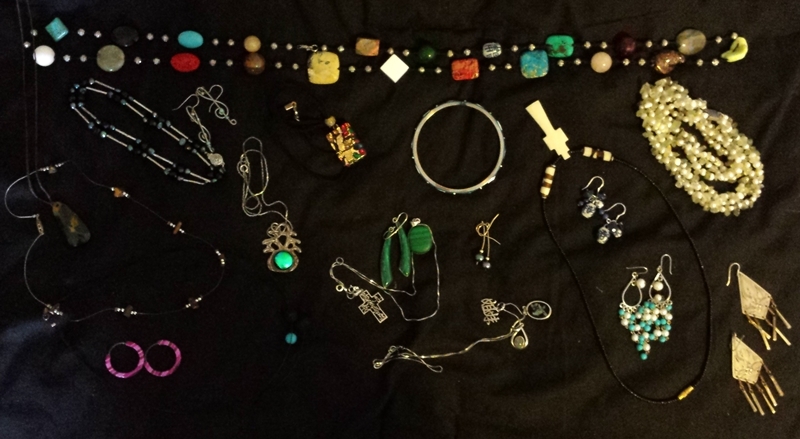 The result is that I end up wearing a lot of jewellery. Not all at once, but I have a large collection of earrings and necklaces in regular rotation. Recently I looked up the actual definition of “souvenir” and realised that my jewellery collection qualifies quite nicely! a usually small and relatively inexpensive article given, kept, or purchased as a reminder of a place visited, an occasion, etc. The English word “souvenir” comes from a French word that means “remember” or the “act of remembering”. That word, in turn, comes from a Latin word, subvenire, that means to “come up” or “occur to the mind”. That’s what wearing jewellery is for me – an act of remembering. There are three hair chopsticks on my shelf (a stick to hold a bun in place, with some sort of decoration). The first I bought in southern Yunnan province, I think on the trip I made with my sister. The second I bought in Xi’an, while travelling with family friends, on one of my last travels in China. The third I bought in Laos while on holiday with my best friend. As a child I collected rocks and gemstones and for years my aim was to own some malachite. I remember looking at a huge chunk of it in a museum in New York and vowing to myself I would get some one day. Now I have a full set of malachite jewellery – a bangle I bought in South Africa, earrings from Cambodia, a pendant and ring from Malaysia. I have the strand of pearls my parents gave me on my 16th birthday. I have a necklace a young man from youth group brought me from a trip to South Africa. I have earrings a young woman from youth group hand made for me. I have bangles another young woman brought me from Nepal. I have 5 sets of jewellery from 5 different weddings in which I was a bridesmaid. I have jewellery given to me by dear friends – friends who moved away from me, or from whom I moved away. I have a necklace my parents brought me from New Zealand. I have plastic earrings my sister bought when she realised my sensitive ears wouldn’t react to them. I have a necklace of volcanic rock she brought me from Europe. I have a necklace and earrings my other sister handmade for me. I have a necklace she brought back after spending three months in northwestern Australia. I have a necklace given to me by children in a village in Vanuatu I lived in for two weeks. I have earrings I bought in the US when I lived there as a teenager. Every item recalls to me a person, a place, an experience. Every now and then I wonder if people around me notice all the bright and beautiful pieces of jewellery I wear. If they ever wonder at how much I have and wear. I know this is unlikely. But I do get comments or questions sometimes, at which point I smile, and share a memory of a place, or a person. My jewellery boxes are treasure chests of memories. The pieces I wear are not fashion accessories. At least, that’s not why I choose them. They are a tangible connection to people and places that matter to me – my souvenirs. Great minds think alike :) Would LOVE a peek at your collection!